When I blog, I try to let words express the depth of my soul. Sometimes I come close, but words can never quite capture my feelings. Nothing that I can say in this entry can quite express how I feel right now, although the philosopher Bertrand Russell’s quote above comes close. I used to poo-poo the notion of angels. Not anymore. Sprite, my cat of 19 ½ years of age who was put to sleep Sunday night, was an angel. He was a special angel sent by the cosmos just to me to provide me comfort, solace and love through two turbulent decades of my life. Sprite was simply love wrapped in a feline form. The depth of his love for me was focused and boundless. Anyone who has had a pet knows how attached you can get to them. However, some pets are singularly extraordinary. That I was fortunate enough to have him as my pet means that there is either is a God or I am the fortunate recipient of a random act of the cosmos. Mark me well. I know how people with pets can love them dearly, as I certainly loved Sprite. Nevertheless, Sprite’s love for me was extraordinary and far beyond what I even imagined was possible in my life. During the stresses of life that would have pulled apart ordinary men, Sprite was there for me. His love was like a thousand watt light bulb. He radiated his love on me in such high megadoses I was able to pull through my challenges time and time again. He did it without saying a word, except for an occasionally silent meow. He did it by looking at me intently with his devotional wide eyes and purring contentedly on my lap. He gave all he had and more for 19 ½ years. He would have stayed with me forever had his body allowed it. However, even with a cat with such a gentle constitution, death could not be postponed forever. Sometime during the last week, Sprite’s intestine became perforated. He developed peritonitis. The twice-daily pills, the daily yogurt, the special cat food and the laxative which kept his symptoms in check lost their efficacy. By Sunday, he had no more appetite and could not even drink from his water dish. He found refuge behind the couch. I coaxed a couple spoonfuls of yogurt into his tummy, which were quickly thrown up. It was time to visit the emergency veterinarian. I prayed of course that we were not to taking him in to be put to sleep. However, the X-rays revealed the sad truth of a cat who had given all he could give. The perforation could be seen easily, and his kidneys were enlarged and his stomach extended. It is unlikely that surgery could correct the problem. He had worn out. There was nothing to do but spare him further misery by putting him to sleep. Sprite was quiet but attentive when we wrapped him in a towel and took him into the car. It was evening. He did not fuss in my arms at all. He looked wide-eyed and with wonder at the streetlights, the signs and the stars. He was calm. It seemed to me that they were a comfort to him. Perhaps they were a distant memory of wherever he was before he arrived in this world. While my wife drove, I gently stroked his face. Underneath the towel, somewhere there was a small but consistent purr. Sprite left this life with dignity and unflinchingly. We held him in a blanket, looked at him intently and stroked him. I told him again for the millionth time how special a cat he was. He truly was the best cat who has ever lived. Gentleness and love expressed the character of his soul. He watched us with his wide eyes, seemingly hearing every word we were saying although we knew he was deaf. He was not afraid but was comforted that we were there for him. The narcotic he was given freed him of his pain. It was my wife and the veterinarian who actually put him to sleep. I could not find the strength for that final act. Simply seeing the euthanasia tube in his paw was hard enough. He watched my wife intently during the euthanasia, half shut his eyes and was gone. He went peacefully, which was right. In addition, he went embraced in love. We will meet again, best friend and soulmate. There is no way I could begin to repay the love you lavished so consistently on me for so many years. I thank you for your gift nonetheless. I know we will be with each other again. For now my love, au revoir. For those who are wondering about the “requiem” music I chose for Sprite, it is “Alleluia and Fugue” by Alan Hovhaness. For me it captures well the bittersweet feelings coursing through my body at the moment. Thank you for the condolences. They help. Oh Mark … I’m so sorry to hear of Sprite’s passing since I (owner of way too many cats for one person) have walked that path myself. It IS hard but we can be thankful to be the recipient of such unconditional love. Peace to you and yes, you WILL see Sprite again. This I know for sure. Mark, your words were beautiful, and I cried as I read them. How fortunate both you and Sprite were to have had so many years together. Having taken too many aching trips down that painful road myself (and with many more upcoming I fear, as my feline crew are all a geriatric bunch), you have my utmost compassion. I’m sorry about your loss. Your comments put me in mind of something I read back in college by Christopher Smart about his cat. For he is the servant of the Living God duly and daily serving him…. For he is the Lord’s poor and so indeed is he called by benevolence perpetually — Poor Jeoffrey! poor Jeoffrey! the rat has bit thy throat. For I bless the name of the Lord Jesus that Jeoffrey is better. I’m so sorry, Mark, for your loss and your broken heart. Thank you for your strength in being able to help Sprite go with diginity. My own Angel, my deeply, dearly beloved, Pinknose, was not quite 14 when he crossed over just a few days ago. Pure concentrated 1 million percent love sent from a divine source, who came to me as a tiny orphan kitten. A package of love wrapped up in the finest solid package of black and white fur, a rose-pink nose, eyes glinting of jade-gold, a strong purr with a very seldom heard tiny mew, dominant among other cats but never domineering, loving, tender, patient and sweet to his fluffy wife Silky (they mated when they met but were fixed, they stayed lovers and companions from then on and frequently cuddled and washed each other in cooler weather). No matter how much I hugged and kissed my Angel, love of my life, inspiration for every day’s labors and troubles, no matter how I tried to cherish each fleeting day, hour, minute that was one less than what was left to enjoy his presence, no matter how I tried to prepare and fortify myself against the dreaded day of losing him, it is still very hard. It is impossible to imagine that this is the end, that I can never see him again, or that you can never greet your Sprite in the realms beyond. There has to be a purr-pose for the love we cherish or this life is utterly meaningless. over four years later I find comfort in your words, in your music. 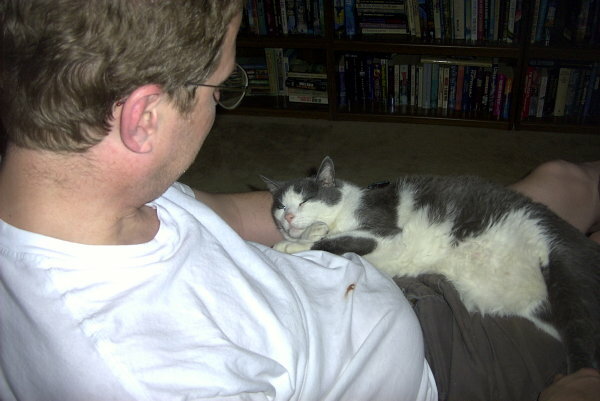 this afternoon I had to – out of feline dignity – put my feline companion of 19,5 years – Puck – to sleep. She was too tired, to weary, enough was enough. But the 2 decades of neverending companionship I will dearly miss, she has been so good to me. I was there when she slowly left this life, thanking her continually for what she has brought me. Beautiful words you have chosen and from the heart I’m sure. We who hold our animal friends as close to us as the human species can emphasize with your loss…I too went through the same process several times over the years with the most recent depicted in my own heartfelt words here. Also, we recently lost a very close friend who, if the Pope had only knew her, would have been canonized along with other great animal protectors such as Saints Francis of Assisi and Martin DePorres… you can find our small tribute here.